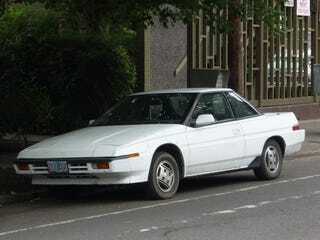 So I had this nutso idea when I was writing up my answer for the QOTD: I want to lift a Subaru XT. Far as I can tell nobody’s done it other than people dropping the body on a truck frame, which for that kind of “lift” you can pretty much name any car and someone’s done it. The thing about the XT... despite being an aerodynamic coupe body, they’re mechanically identical to pretty much all the other Subaru models of the day. I’ve owned four XT’s and six various other ‘80s Subarus on that platform and under the skin, most of the parts interchange. Including the suspension and subframe components. The XT struts are a little shorter than the others, and I used a set of them to lower another Subaru I had. Lifting Subarus is nothing new. It’s been done many times to many models. The lift kits are available for purchase online, and parts are plentiful. There’s no reason I can think of why it couldn’t be done. The only other hangup is the transmission. The sedans/wagons/coupes were offered with a dual range 4x4 transmission; the XT’s were not. But once again, the parts interchange. Save for the missing dual range equipment the XT transmission is the same as all the others, and I’ve actually swapped a single range XT transmission into another Subaru before. Like I said, I can’t think of any reason why one can’t do this. If only I weren’t broke and didn’t already have a project waiting for me.